Publisher: St. Martin's Press, 2014. I accidentally read a grownup book. It was my own fault really--I assumed because the author had written YA and because the cover just looked so YA, that it would be YA. But it wasn't. I suppose maybe you could say it's that New Adult classification they are trying to push now. Georgie McCool is a TV writer having a hard time balancing her job with her family. Her husband picks up most of the slack, but when she tells him she can't go visit his family for Christmas, Neal has had enough. He packs up the kids and visits his family without her. Wondering if she has finally ruined her life for good, Georgie goes home to her mother's house and discovers a mysterious way to communicate with Neal... but it's the Neal from her past. Georgie is given an opportunity to change things, but should she? 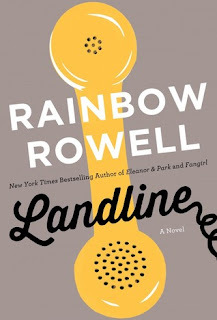 I love the idea of Landline. I definitely prefer Rowell's YA fiction and I didn't love Landline the way I loved Eleanor & Park, but Landline resonated with me in a way I wasn't expecting. I understand all of the criticisms I've read about it. But I couldn't stop reading this book. I finished it in one night, which is not a normal endeavor for me. Georgie wasn't the most sympathetic character and Neal wasn't the typical romantic hero and that may have been why I was so drawn to them. I wanted them to work out and I wanted to keep reading to see if they did. Although there's nothing in here to prevent teens from reading it, it's not YA. It takes a grownup's experience to appreciate Georgie's struggles and to be able to truly sympathize with a marriage on the rocks.